The Chief of the Phuket Provincial Employment Office, Kattiya Pandech, has confirmed to The Phuket News this week that new provisions issued by Royal Decree in March are in effect, allowing foreigners with work permits to legally work in any field, anywhere in the country, for any employer as long as the work being done in not on the list of occupations prohibited to foreigners. This means that foreigners who have been issued work permits are no longer restricted to performing only the type of work listed in the work permit, or at the exact location listed in the work permit, or for the employer listed in the work permit, or even in accordance with the conditions listed in the work permit, Mr Kattiya told The Phuket News. There is not even any legal requirement for foreigners to inform his office of any changes, he added. However, Mr Kattiya did caution that foreigners and employers ‘should’ register any changes to their work situation with the Employment Office to avoid any confusion or misunderstandings that may arise. “There is no law requiring this anymore, but it would be best if people did register their changes,” he said. The changes came via the Emergency Decree on Non-Thais’ Working Management (No.2) (2018), Mr Kattiya confirmed. “This law was passed on March 27, and came into effect on March 28… We have announced it on the website www.doe.go.th in Thai, but we don’t have an English version posted yet,” he said. Section 37 of the Emergency Decree this year annulled Sections 70, 71, 72 and 74 of the Emergency Decree issued in 2017. More importantly, Mr Kattiya also confirmed that Section 28 of the Emergency Decree issued this year provides that a work permit holder may engage in any work that is not specifically prohibited to all foreigners (see below). Regarding the now-annulled Section 70 of the old law, Mr Kattiya noted, “Foreigners are now able to work anywhere in the country without registering the change in their work permit, but each foreigner’s employer must be listed in the work permit. “If an employee is transferred to another office elsewhere in the country, the employer should notify the Phuket Provincial Employment Office,” he said. “It is the employer’s responsibility to inform our office of the location and the employee’s job to be listed in the work permit, but then the employee does not need to strictly adhere to that. It is just to register the main place of work and the main type of work the foreigner was hired to do,” he added. Mr Kattiya noted that the Phuket Employment Office renewed or issued new work permits for 16,000 foreigners from March 28 through July 30. However, the work permits issued during that period still contain the warnings on the inside back cover specifically stating the old restrictions forcing foreigners to strictly abide by the descriptions literally printed in the work permit itself. “These are the old books that were printed in accordance with the Emergency Decree issued last year,” Mr Kattiya said. “The new books will not have Note 2 when they arrive,” he said. Mr Kattiya was very strong on the point that foreigners were still banned from performing work in the fields still prohibited by law. The list stood at 39 occupations prohibited to foreigners since the law was introduced in 1979, but was revised down to 28 occupations in June this year. Although for some reason as of Wednesday (Aug 29) the Ministry of Interior still listed the 39 occupations in full on its website (www.mol.go.th), Labour Minister Adul Sangsingkeo in June announced that 12 occupations had been removed from the list, with foreigners allowed to engage in work in the 12 new fields from July 1. The 12 new fields that foreigners are now allowed to work in predominantly focus on unskilled labour, Thai handicraft production and other forms of manual labour. However, in professional work, foreigners may now work in engineering, architecture and accounting as long as the foreigner has been accredited by the relevant Thai authority or trade association. Meanwhile, for example, it is still illegal for foreigners to sell products at a shop; work as a tour guide; work as a secretary; provide legal counselling service; sell by means of an auction; and work as a trade and investment representative or broker (unless hired by an international organisation). Some old rules still apply, such as the requirement for foreigners to carry their work permit with them at all times while performing work, Mr Kattiya noted. The penalty for failing to do so is a fine of up to B10,000. However, Mr Kattiya explained that the Labour Ministry is working towards the old-fashioned work permits books being replaced by smart cards. “We are working on foreign employees in the future to have smart cards (instead of books), and we are currently developing a system for submitting work permit applications online. We want this part of our job to be easier,” he said. 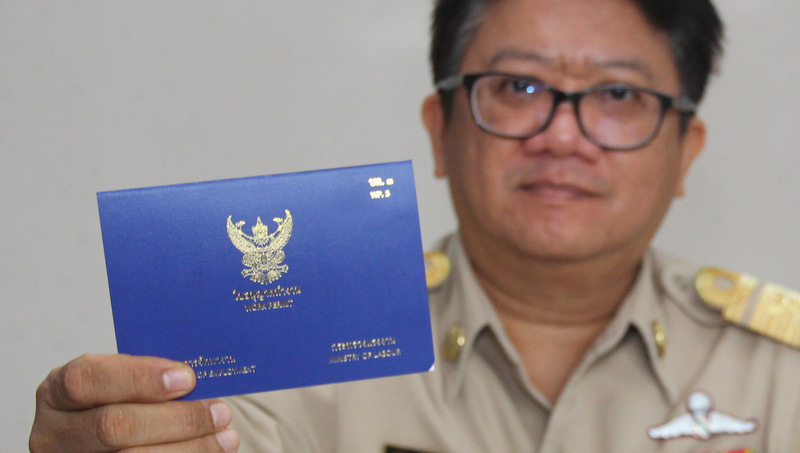 On closing, asked whether Royal Thai Police and Immigration officers in Phuket had been informed of the new laws, or more accurately which old laws are no longer valid, Mr Kattiya said, “The Royal Thai Police and Immigration must know about it. They must not ignore this because the national official in Bangkok communicated this very clearly shortly after the law came into effect in March. “They can’t pretended they do not know this information. They can’t charge foreigners for breaking the old law, the update has been made already,” he said. This is great progress. We might even hope that this reduction in (ahem) 'protectionism' might inspire similar progress in the rest of Thai society. Me, I'll hold judgement until I renew my own WP early next year. It's been getting increasingly difficult in recent years. This all concerns Foreigners, but : "We don't have a English version posted yet". Mind you, the 'change' of the law became effective March 28th! Good to read the warning towards RTP and Immigration that they are informed and not can ignore the change of this thai law. OK, this sounds good. I like the idea of a 'smart card' too. Something like this for passport verification would also be nice. Carrying two important cards in my wallet is certainly easier than carrying a wallet, passport, and work permit. Good luck with the program and thanks.